Join the discussion on our forums! Come discuss Waggle Pick over in our dedicated Waggle Pick discussion topic. Kobolds informally refer to its effect as a deathwaggle. A new player sees a downside. A experienced player sees a upside. Rogue’s version of Truesilver Champion. Compared to every other class, Rogue has the least need for weapon cards because weapon cards conflict with their hero power. It depends on the strength of the Deathrattle. If you're already holding a weapon but don't want it to break right away, your hero power is useless. Looks more like: go face pickaxe and extra battlecry at the end. Rogue with Shadow Blade in standart on 03.04.2019 called Pirate Rogue, miracle always use both Gadgetzan Auctioneer or one Sprint and one Gadgetzan Auctioneer with no exceptions. If Rogue use both Sprint or even use just one Myra's Unstable Element and all of it without a pirates call it Tempo. P.S. And yes it's a bad replacement. 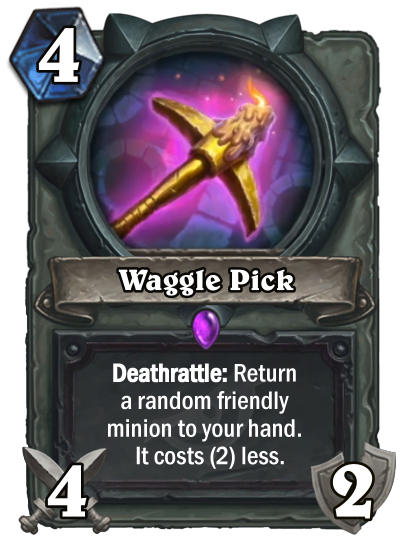 Like alll of new Rogue cards are mediocre, it's not bad...just not graceful. If u dislike my appeal without a comment, u can also dislike my decks (find it on my acc). I've left "arrogant"comment under of each new Rogue card, can be fun for answering them. Hope evryone would bet on Purple next time. Name always inspired the respect. Pogo Rogue WILL be a thing even if its not as fast as we need... YET. Archtype is being pushed and they plan a set a head at least to a degree. When I won in past some control decks (some because i'm not playing too much with Pogo) I want to add my opponent and say "sorry" , because this deck is for cemented minds, like an a archetype. P.S. Blizzard add some tech cards vs Mecha'thun decks, let's see if Pogo Rogue not become a problem.